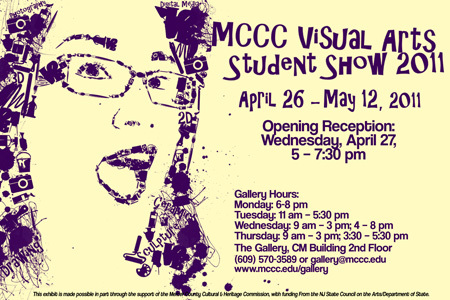 West Windsor, N.J. - The artistic talents of Mercer County Community College's Visual Arts students will be beautifully showcased in this year's "MCCC Visual Arts Student Exhibition," on display from Tuesday, April 26 to Thursday, May 12. The exhibit is free and open to the public and takes place at The Gallery at MCCC, located on the second floor of the college's Communications Building on the West Windsor campus, 1200 Old Trenton Road. An Opening Reception takes place Wednesday, April 27, 5 - 7:30 p.m. The reception will feature music by the Michael Huse/Gordon Stewart bass/sax duo. Eighty students have contributed works of art in a variety of styles and media. Approximately 160 two-dimensional works in oil, acrylic, watercolor, print, collage, illustration, photography, and foam core will be exhibited, along with 24 three-dimensional works in wood, ceramics, plaster and mixed media. Visual Arts student Cynthia Rivera designed the winning postcard. Says Gallery Curator Tricia Fagan, "We welcome the opportunity to introduce these emerging artists to art enthusiasts in our community. This is one of our largest shows ever, and still is just a sampling of all the art that is created by students studying in our Fine and Visual Arts programs . Viewers will be amazed by the breadth and depth of this exhibit." The winning design for the show's marketing postcard was created by Visual Arts student Cynthia Rivera. Five additional students created winning posters, which will publicize the exhibit around the campus. They are: Steven Biroc, James Pitonyak, Eli Rivera, Paul Toncgo and Sharon Uveges. Gallery Hours for the exhibit are: Mondays, 6 p.m. - 8 p.m.; Tuesdays, 11 a.m. - 5:30 p.m.; Wednesdays, 9 a.m. - 3 p.m. and 4 p.m. - 8 p.m., and Thursdays, 9 a.m. - 5:30 p.m. For more information, call the Gallery at 609-570-3589 or visit the Gallery website.